As discussed in my previous post, Kepler’s improvement of Copernicus’s heliocentric system led to its more general acceptance, and his three laws describing the way planets move are fundamental laws of astronomy. 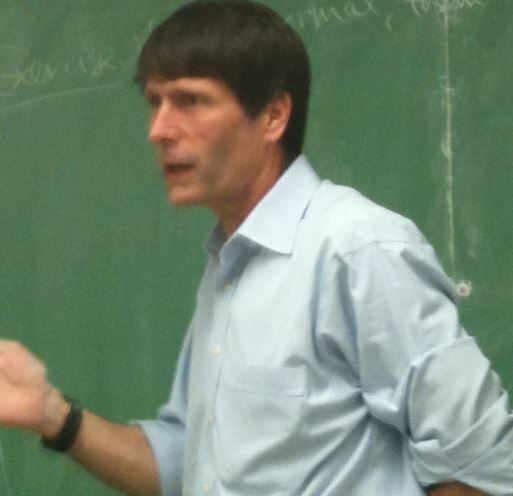 However, this wasn’t his only contribution to science. 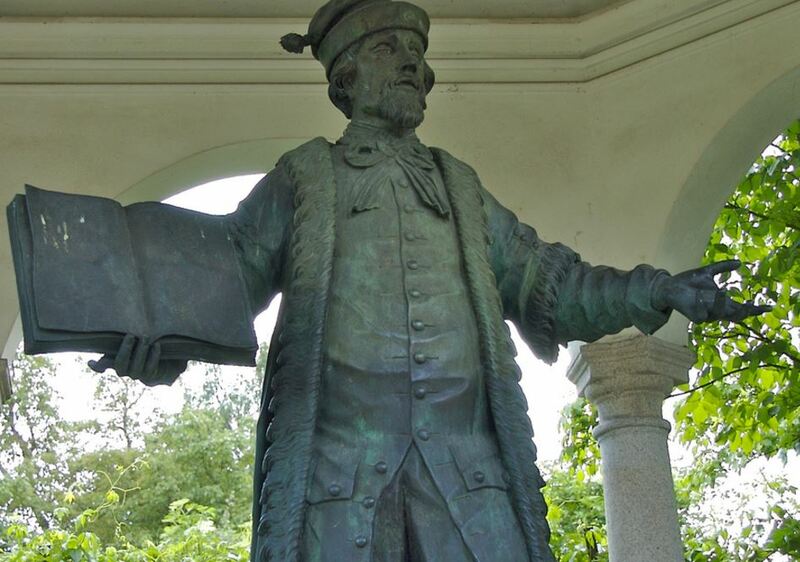 He was one of the greatest thinkers of the seventeenth century scientific revolution and in this post I’ll outline some of his other major achievements. In 1610 Kepler began theoretical and experimental investigations of the way that different combinations of lenses could work together to produce a magnified image. He published his finding in a book called Dioptrice, which laid the foundation of modern optics. Using the results of his investigations, he invented a new type of telescope with a different combination of lenses than that which Galileo had used. 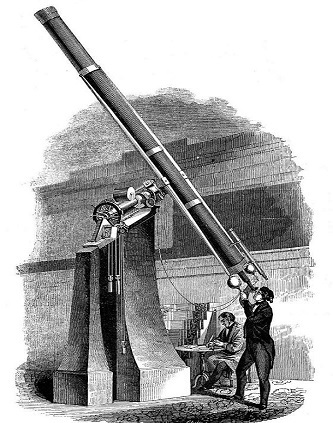 This new design became known as the Keplerian telescope. It is still in use today and enables a higher magnification to be achieved with less distortion than a Galilean telescope. For more details on the differences between the two types of telescope see the notes at the bottom of this post. In October 1604 Kepler took observations of a new object which had appeared in the constellation Ophiuchus. Although Kepler was not the first to see it, he took accurate measurements of its position and brightness over a period of year. It it were closer than the background of fixed stars then, at different times of year, the new star would appear to be in a different positions with respect to the more distant background of fixed stars. As this shift in position was not seen, the new star must be the same distance as the fixed stars. The appearance of a new star which increased in brightness and then gradually faded over time contradicted an important belief, which had been held since ancient times, that all the stars were fixed in position respect to each and were unchanging. 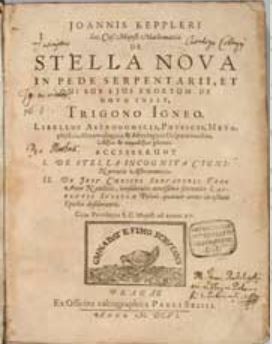 In 1606 he published his results in a book called ‘De Stella nova in pede Serpentarii’, which like most scientific literature of the time was written in Latin. Today this object, rather than being a new star, is known to be a supernova, a massive star which exploded at the end of its life. The explosion completely destroyed the star, blowing the outer layers into space in a massive glowing gas cloud, which is what Kepler observed. The remnant of the supernova is officially known as SN 1604 but is more commonly called Kepler’s supernova and is 20,000 light years away, which is well within our Milky Way galaxy. 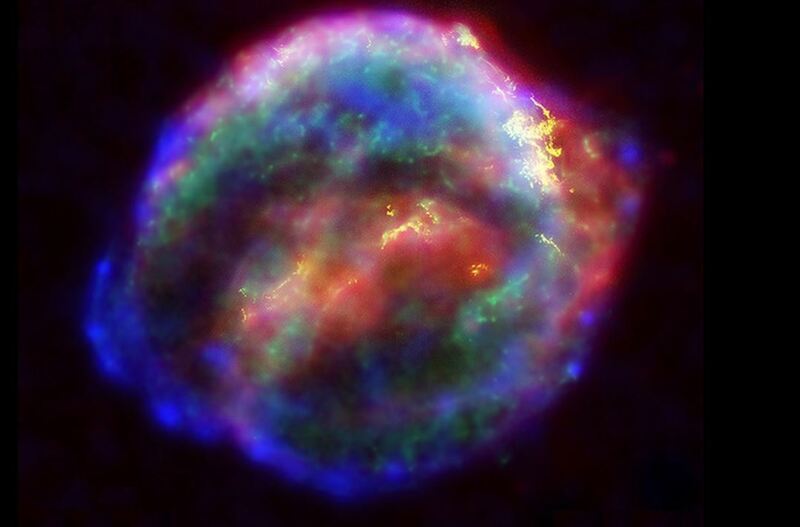 It is the last time that a supernova exploded close enough to be visible to the naked eye. Kepler’s contributions weren’t restricted to astronomy either. In 1611 he produced a pamphlet entitled Strena Seu de Nive Sexangula (A New Year’s Gift of Hexagonal Snow). In this he published the first description of the hexagonal symmetry of snowflakes. 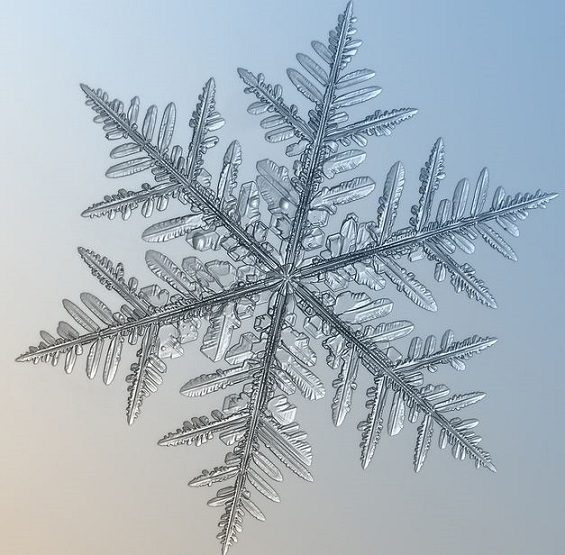 All snowflakes when freshly formed have a hexagonal symmetry such that shown above. Kepler discovered a series of regular solid shapes, which are known as ‘the Kepler solids’. The term ‘regular’ means that all the faces are the same. Imagine filling a large container with small equal-sized spheres. The packing density is equal to the total volume of the spheres divided by the volume of the container. So a packing density of 1 would mean that there was no free space at all. ∏ /(3√2), (which is roughly equal to 0.7405). ∏ /(3√2) is the packing density we get if we pack together spheres in layers, as shown in the picture below. So what the Kepler conjecture in saying is that there is no other arrangement out of the very large number of possible ways to pack spheres together which gives a higher packing density than that shown in the picture. Although Kepler and other subsequent mathematicians believed this statement to be true, they were unable find a way to prove it. For over 400 years, it remained as one of the greatest unsolved problems in mathematics. It wasn’t until 2017 that a team led by the American mathematician Thomas Hales proved it to be true (phys.org 2017). Interestingly, Kepler also has the distinction of writing what the astronomer and science educator Carl Sagan called the first ever work of science fiction. It was written in 1608 in Latin and is called Somnium (The Dream) and is about a man who travels to the Moon. In this book he describes how the Sun, Planets and the Earth would appear to an observer on from the viewpoint of the Moon. In Kepler’s time is was not known how harsh and barren the Moon was as an environment and some writers had speculated that there might be creatures on the Moon similar to those found on the Earth and even lunar civilisation. To Kepler it was clear that the dual effects of the lunar climate and the irregular, hostile terrain would produce plants and animals far different from those that inhabit the Earth. in Kepler’s Lavania (which was the name he gave the Moon in Somnium) there are no men and women, no civilizations. I hope you have enjoyed reading this post. I have tried to outline some of Kepler’s achievements, but in a 35 years scientific career he made many additional contributions, which I’ve not had time to mention, including discovering how the human eye works. What is clear to me is that he is one of most important thinkers of the scientific revolution which took place in Europe during the seventeenth century. These additional notes give a brief overview of the differences between the Galilean and Keplerian telescopes. I will discuss them in more detail in a subsequent post on how telescope work. To understand how these telescopes are constructed it is necessary to understand a little about lenses. A converging lens, shown in the top of the diagram above, causes parallel light rays from a distant object, shown in red, to converge at point known as the focus. The focal length of the lens is the distance between its centre and the focus. A diverging lens, shown in the bottom of the diagram, causes parallel light rays from a distant object to spread out so they appear to come from the focus. Like a converging lens the focal length of the lens is the distance between its centre and the focus. By convention the focal length of a a diverging lens is negative. A Galilean telescope consists of a converging lens of long focal length (known as the objective) and an eyepiece which is a diverging lens of a shorter focal length. If FO is the focal length of the objective and FE the focal length of the eyepiece, then the magnification is given by FO/FE. So a Gallilean telescope with an objective with focal length of 50 cm and and eyepiece of focal length of -10 cm, would have an magnification of -5. The minus sign just means the objective is the right way up. A Keplerian telescope consists of a converging lens of long focal length (known as the objective) and an eyepiece which is a converging lens of a shorter focal length. It can achieve higher magnifications than the Galilean telescope and has a larger field of view. As with the Galilean telescope, if FO is the focal length of the objective and FE the focal length of the eyepiece, then the magnification is given by FO/FE. So a Keplerian telescope with an objective with focal of length 300 cm and and eyepiece of focal length of 5 cm would have an magnification of 60.
phys.org (2017) Mathematicians deliver formal proof of Kepler Conjecture, Available at: https://phys.org/news/2017-06-mathematicians-formal-proof-kepler-conjecture.html(Accessed: 25 January 2018). Next Post American manned spaceflight in 2018? It looks very interesting ! Reblogged this on The Somnium Project. Yes definitely. He was of the greatest scientific geniuses of the seventeenth century. Now that I know Kepler wrote a science fiction novel, I will make a point of reading it. Enter your email address and click on 'Follow the Geek' to join the growing band of people following the Science Geek. You will be sent my latest post as soon as it is published.